Wordcamp UK 2009 to Liverpool? Well, we’re going to try! WordCamp is a small, informal conference all about WordPress and its people. Wordcamp UK 2008 was held in Birmingham last year. The current list of nominated venues are in Liverpool, Cardiff and London. Read the pdf attached below, and see what you think. Feedback would be great, but if you really want the WordCamp to take place in Liverpool on the 18th and 19th of July you’ll need to pipe up on the official mailing lists. More info at Tony Scott’s blog. 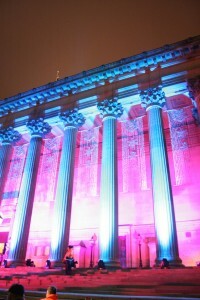 St. George's Hall, Liverpool - not the likely venue. Pic by Me.